Open pores on face can damage your beauty appearance and make your look older. Everything effects on skin like poor skin care, weather, aging and food too. Especially Oily skin type more effected with this problem because excess sebum when mix with dirt and bacteria, tends to clog the pores which leads to blackheads then acne. 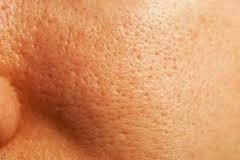 The most usual causes of large open pores is acne infection and the picking of pimples leaves a scar and pore. Prolonged sun exposure can contribute to damage your skin cells. It is not difficult to tighten the pores and close them completely here we have some useful natural home remedies that can help to get smooth and beautiful skin without open pores. Make a paste of Oak tree gum with milk and apply it on your face for 20-25 minutes. It really works to close the pores. Papaya Pulp to Shrink Then Close Open Pores Apply Papaya Pulp considered very effective for open pores. Apply it on effected area daily and leave the pulp for 25-30 minutes for better results. Make a mixture of Egg white and 2 tablespoons Aloe Vera Gel. Apply this paste on open pores for 15-20 minutes. It will reduce the size of open pores within 8-10 days. Apply a mixture of Aloe Vera Gel and Lemon Juice on your face. Leave it for 15-20 minutes and wash it off with cold water. Take 1 teaspoon Banyan Tree Gum and mix Cucumber juice in it to make a thick paste with it. Apply it on your face and leave it for 10-15 minutes then wash it with normal water. Then apply again ice cube massage for 5-6 minutes. Open pores seems enlarged when they are blocked with oil. Grind 125 grams Mung beans to make its powder and keep it in a glass jar. Make a paste with 1 tablespoon Mung beans powder by mixing water in it. Apply it on your face for 15-20 minutes than wash with normal water. It will removes all dirt and oil from your open pores on nose. Mix 1 teaspoon Lemon Juice in Egg White. Apply it on your face for 15-20 minutes then wash with cold water. Make a paste of 1 tablespoon Fenugreek Powder, 1 teaspoon Ginger Powder in Cucumber juice. Apply this paste on your face for 20-25 then wash it with cold water. You can add milk in place of cucumber juice too. Very much effective remedy for open pores. Add 1 tablespoon Honey in 1 teaspoon Apple cider vinegar and 1 tablespoon Wheat Gram. Make a smooth paste and apply it daily for 20-25 minutes till pores heal. Mix 1 tablespoon Honey in 3-4 tablespoons of Tomato Juice and apply it on your face pores for 15-20 minutes. It will bring back the large open pores to their normal size. Make a paste of Sea salt and Butter and apply it on pores for 15-20 minutes to reduce the pores size. Mix 1 tablespoon Chamomile Powder in Tomato juice and make a paste. Apply it on pores for 20-25 minutes. Put the lemon juice in a bowl, add the honey and mix until completely dissolved. Slowly add the green clay and mix to a thick paste. If it’s too thick to stir easily, add one egg white. If it’s too runny, add a little more clay. The paste should be thick enough to stay in place on the spoon and your face without dripping. Apply and rinse off, as suggested above. Mash the banana and blend with the cornmeal and aloe Vera gel. Add milk to make a smooth but not runny paste. Then apply and rinse off, as suggested above. Mash and mix all the ingredients to create a spreadable consistency. Also useful for backs of hands in winter, skin blushed bride tone and tighter open pores. Apply as suggested above, then, after washing it off, finish with a rose water application. Mix all the ingredients and apply on your face 20-30 minutes twice in a week to keep your face permanently from this problem. 6)Wrape ice piece in a cotton cloth and apply it on the affected area for 5-6 minutes but not more than this because open pores on the skin keeps the softness and freshness on your face. 7)Keep away your skin from oil and dirt wash your face with cold water at least 3-4 times daily. 8)Use sunscreen on your face when you are going out in the sun and wash your face when you come back home. 9)Avoid to eat oily or fry, spicy and fast foods. 10)Daily use one glass of fresh fruit juice early in the morning before breakfast.